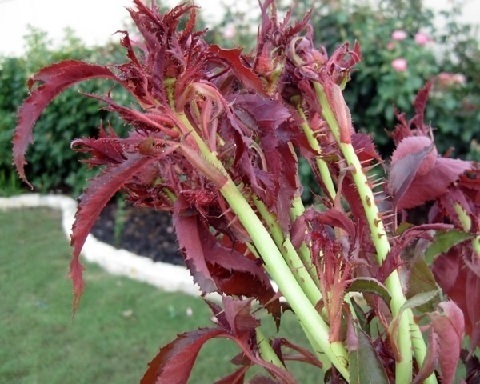 Symptoms of Rose Rosette - red deformed new growth and dramatically deformed thorns. The original Knock Out Rose was created by Wisconsin rose breeder William Radler and introduced in 2000 by The Conard-Pyle Co./Star Roses. It is cold tolerant to zone 5, heat tolerant throughout the U.S., reliably resistant to disease and produces lots of blooms every 5 to 6 weeks from spring until the first hard frost. All that sounds good, but not so fast. The Knock Out Rose seems to be one of the main targets of a viral-like disease called "rose rosette". The fact that so many of the once thought carefree rose have been planted is a major part of the problem. Virtual monocultures have been planted in many parts of the country, especially the south. 1) Stop planting so many of this variety and add some biodiversity to your rose planting. 2) Apply the procedure called the Sick Tree Treatment. It is explained in detail under Guides on the home page of DirtDoctor.com and also in a past newsletter found in the Natural Organic Library of DirtDoctor.com. Prune off the diseased and deformed growth. Spritz-spray the cuts and tools between cuts with 3% hydrogen peroxide. Aerate the root zone and apply the organic bed preparation amendments. Remove soil and mulch from trunk flares of bushes. Mulch bare soil away from trunks with shredded native tree trimmings. Spray plants and beds with Garrett Juice with 16 ounces of hydrogen peroxide added per gallon of mix. 16 ounces less water can be used per gallon. Go organic and especially eliminate the synthetic fertilizers. If you haven't already, join me Sunday 8-11am CST and check this page - Radio Stations - on DirtDoctor.com for locations coast to coast and border to border. You can also listen on the internet or to past shows. The phone number for the show is 1-866-444-3478. Join the Organic Club of America today and receive wonderful GIFTS.